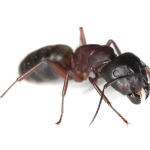 Ant Pest Control, Exterminating Services on Long Island | EcoTech Pest Control Inc.
EcoTech Pest Control Inc. uses many methods to eliminate ant problems. The key to solving ant problems is to locate and destroy the colony. Many different target specific baits are used that work ants will bring back to the colony, that will ultimately lead to their demise. Along with baits, EcoTech will create barriers that will help to control future infestations. As with all programs, EcoTech Pest Control offers monitoring and pro active measures that are foundation of a pest free environment. Carpenter Ants are the largest species of ant found in North America. They can be brown, yellow/orange or several other shades, but they are USUALLY black. If you look closely at the abdomen, you will notice a ring of hair going around it. This is one way to tell for certain if you are dealing with a CARPENTER ANT. CARPENTER ANTS nest in many places, including the ground, but usually they build their nests in the pulp of wood. Unlike TERMITES, CARPENTER ANTS do not EAT the wood. They simply excavate galleries for themselves to live in, scooping out bits of the pulp and spitting it out the entrance to the nest. As the number of ants in the colony grows, they excavate more and more galleries to accommodate their needs (much like putting an addition on your house as your family grows). Odorous House Ants look very similar to the pavement ant. The two distinguishing differences are that they do not nest in the ground or create anthills, and they produce a strong stinky odor when crushed (thus the name ODOROUS house ants). These ants will find their way into your home through any crack in the foundation or seam in your construction, and will begin nesting in wall voids behind the sheetrock or plaster. If your home is on a slab or crawl space, they will simply nest beneath your home, and come up through plumbing or electric work. CALL (631) 868-7023 TO SCHEDULE YOUR FREE INSPECTION.